After rejoining the world of the working (7 out of the past 10 days) , I decided to treat myself today, and had a very fine night of cocktails tonight. Went to the Zig Zag and had a Blanton's mint julep, a Jack Rose with the Lairds 12 year (made with Scrappy grenadine) and finished up with a Zaya Hemminway daiquiri. All were outstanding. The daiquiri had a chocolaty taste that was totally unexpected. Finished up back at Spur with another Hemmingway and a bison burger fixed with caramelized onions, Tasmanian peppercorn ketchup, and provolone. About a month ago I remembered I had a bottle of neutral grain stashed away and I decided to start up a batch of bitters of some sorts... Like most things I do it was not planned out ahead of time. I made a trek down to the market and pondered the selection at Tenzing Momo, knowing only I wanted something that sounded funny. 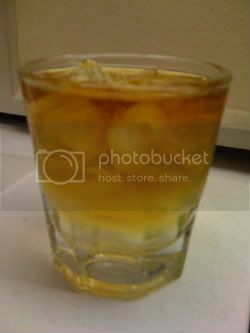 Walked out with a dried ounce and at home added it to four liquid ounces of neutral grain spirits in a mason jar. I left it alone aside from a general shaking every so often for a month. During that month I decided on how I would finish the process and decided to stick with using molasses like I did for the batch of Broken Hibiscus Bitters. Strain the liquid from the mason jar mixture several times through cheesecloth to remove as much debris as possible. In a separate container add one ounce of full flavor molasses to seven ounces of boiling water, as to fully disolve the molasses. Combine molasses mix and sassafras mix together to finish. This recipe made just enough to fill an empty mid-sized Agnostura bottle. Now just to find a good use for it. So what some others have referred to as my "retirement" is coming to an end. After 3 months of just mondays and scant shifts between, I'm rested and ready to gat back at it. Thing is times are tough all over and a lot of people who have bartended in the past are applying. I went on a cattle call of an interview that had 300+ applicants. Long story short I was happy to say yes when Dave Nelson from Spur Gastropub called me up and asked if I'd be interested in one or two days a week. I am already familiar with the program, won't be overworked, but can cover at both jobs if need be, and will get to cook and dabble with things at the molecular level again, which frankly I have missed. I'll be at Spur on Saturday and Sunday, while still doing my thing on Mondays at Sun. Tomorrow the WSBG is having an event on vermouth. I don't know too much so I'll try to get my learn on. Tonight was the first really busy night I had worked in a while and it was fun to hustle again. I just wish I hadn't painfully reminded myself of the incorrect way to hold citrus while using a y-peeler. Nice gash on the left thumb to match the two nicks on the right. I hope I can claim this. If its known by another name I am unaware, and trust me I looked. I prefer it on the rocks, but it holds its own in a cocktail glass. As a working bartender I face this often on a nightly basis. I believe 90% of people who get vodka sodas are doing it cause they don't know any better. There is nothing better than that first time you get someone to try gin, whisk(e)y or rum for the first time, and they cannot believe their previously held notion any longer. There are a ton of ways to lead people further in their path to cocktail glory, these are just some that I like. Its about finding the Menu of the Heart. These are usually less fun and more of a challenge, but a moscow mule or fresh squeezed greyhound or screwdriver will get you some more leeway. "Can I get a Jack and Coke"
Yes ya can, but might you want to try a whiskey sour, old fashioned, or a sazerac for the daring individual. I'm glad gin has been increasing in popularity. A corpse reviver #2 or Last word usually does the trick. I am a personal fan of gimlets with a bit of muddled cucumber. Oh hell yes you can. If you haven't had an El Diablo that might be good next. "Can you make a Malibu and pineapple?" Don't laugh... I've been asked that. I'll also ask if they want a cherry. 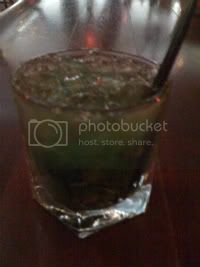 Other rum favorites are Mai Tai's, Pina Coladas or dare I offer a Mojito. But there was a rum drink that opened my eyes to the fact that a well made drink was a thing of beauty. 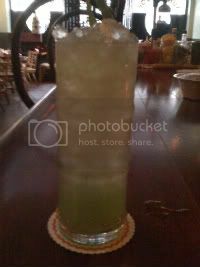 This was the first drink I ever had at the Zig Zag. It kind of took on cult status within my friends and we all held up this or a similar recipe as the standard. I have never been in the West Indies, but I am in a position to state that in certain of the fundamentals of life they are streets ahead of our European civilization. The man behind the counter, as kindly a bloke as I ever wish to meet, seemed to guess our requirements the moment we hove into view. Scarcely had our elbows touched the wood before he was leaping to and fro, bringing down a new bottle with each leap. A planter, apparently , does not consider he has had a drink unless it contains at least seven ingredients, and I'm not saying, mind you, that he isn't right. The man behind the bar told us the things were called Green Swizzles; and, if ever I marry and have a son, Green Swizzle Wooster is the name that will go down in the register, in memory of the day his father's life was saved at Wembley. 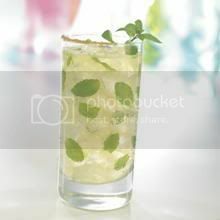 from "The Rummy Affair of Old Biffy,"
Garnish with fresh mint sprg. 7 ingredients. I think that I added the sugar / simple syrup somewhere along the way. That's where the confusion resided." Recently , since the return of Absinthe to the market, I've begun to believe that the green fairy was the inspiration for the green swizzle, and not creme de menthe.... or at least thats what I want to believe. This is something I've been making lately and have been calling it the Green Swizzle Wooster. "I have never been in the West Indies, but I am in a position to state that in certain of the fundamentals of life they are streets ahead of our European civilization...A planter, apparently, does not consider he has had a drink unless it contains at least seven ingredients, and I'm not saying, mind you, that he isn't right. The man behind the bar told us the things were called Green Swizzles; and, if ever I marry and have a son, Green Swizzle Wooster is the name that will go down in the register.."
there is a lot of debate on the history of his drink, and the recipe I use is what me and a friend think it may have been like. Add mint and simple in a pint and gently bruise mint to release flavors.... gently. add rum, lime absinthe and bitters, shake with normal ice, then strain into a collins style glass. add crushed ice until glass is full. garnish with a mint sprig or lime or both. Looking to shake things up on the biggest drinking holiday of the year? This St. Patrick’s Day, trade your shamrocks for mint leaves and green beer for Tequila and try your luck with a specialty “Hornijo” from Hornitos™. A unique new spin on the classic Mojito, the Hornijo features Hornitos Reposado, a premium 100% agave tequila versatile enough for mixed drinks. Whether throwing your own party or enjoying a pre-parade cocktail, show off your creative side this March 17th with a festive and green Hornijo! Please see below and let me know if I can send you additional information or a high-res image. I don't want this to come across like I'm dissing Hornitos. I am a huge fan of using it in cocktails, order it often and fully enjoy it. However this promotional campaign is a touch offensive to me. Taking a trendy traditional rum drink and subbing your product of a different spirit ( yes, i'm looking at you, the bars that have vodka infused mojitos on the menu ) just in time for a traditionally Irish holiday is weaksauce. The name Hornijo is fun to say though, I can imagine across the country as barstaff ask big burly redheaded Irish dudes (stereotype!) if they'd like a horny ho. I've had this tequila recipe for a bit but haven't been able to name it the horni-huh? Add all ingredients in a pint along with a hawthorne strainer spring and dry shake vigorously. Add ice, remove spring and shake vigorously again. Strain into a chilled collins glass and slowly fill with ginger beer.